Cystic conditions are one among the commonest clinical conditions that we encounter in our day to day practice. Most of cysts in the body are benign or dysfunctional tumors. It can be treated successfully with our dynamic medicines. Here Dr.K.Savitha compiles and presents a case of Chocolate Cyst treated successfully at AKP Homoeopathic Clinical Research Center. She can be contacted at AKP Homoeopathic Clinical Research Centre, 6 Lloyd's II Lane, Royapettah, and Chennai 600014. 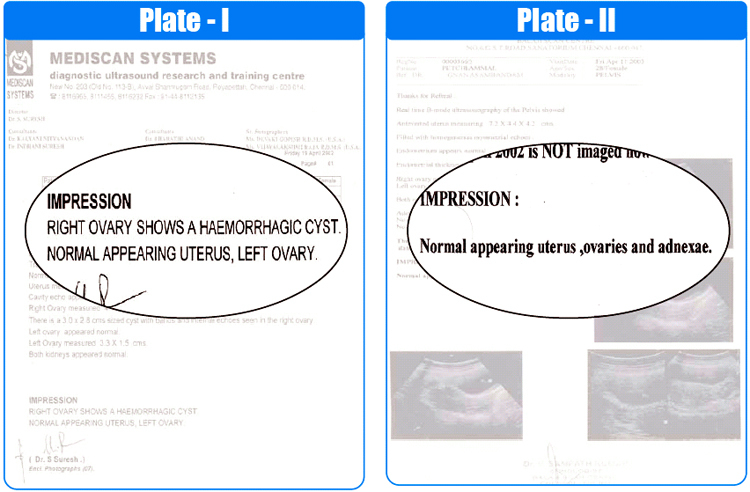 A female aged 28 years presented pain with during periods since four months. Additionally she has white discharge since 6 months. Every month the pain was intolerable which radiated to low back and to legs on both sides. • She had been vaccinated for all communicable diseases.